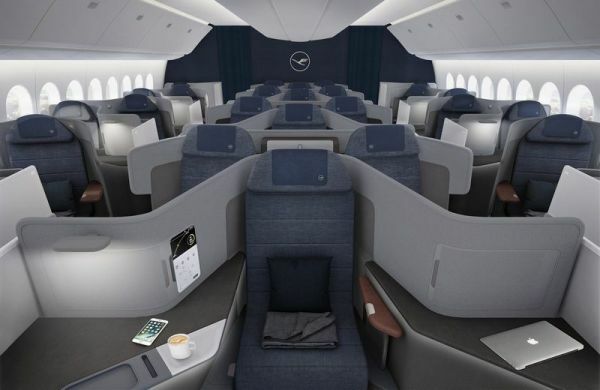 Three years from now Lufthansa passengers will experience an entirely new long haul Business Class. Lufthansa teased the cabin with renderings it shared on Twitter this week. These indicate a layout with direct aisle access from every seat and "throne" seats in the center row. 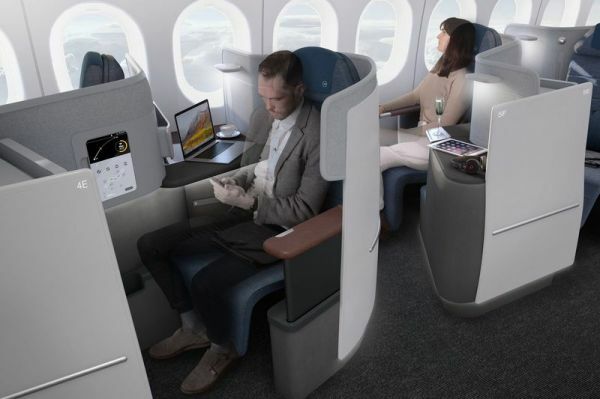 "A special shoulder zone for side-sleepers and larger monitors" will be part of the new experience that replaces the a little outdated 2-2-2 Business Class configuration Lufthansa introduced 2012. Seat and IFE will interact with an app to customize the flight. The 777-9 will kick off a fleet wide cabin refurbishment that will include widebodies at Swiss and Austrian in a move to streamline the product strategy across the group. Lufthansa mulls a "Business Plus" product to replace First Class on some of the 34 777-9 that will replace Airbus A340-300 and 747-400 widebodies. An updated Premium Economy is also on the Lufthansa agenda for the 2020s and its 777X cabin strategy.